At Adamstown Veterinary Hospital, we take the health and safety of your pets very seriously. Health certificates are designed to ensure that we have examined your pet and deemed that they are healthy enough to travel safely. When considering the safety of your pet, we also need to consider their travel conditions. 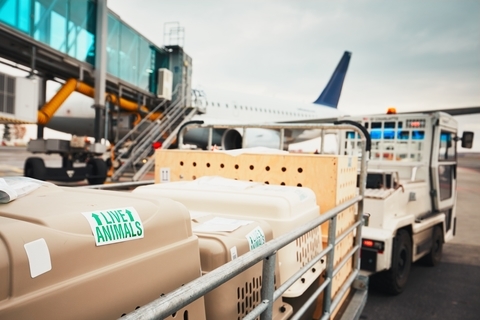 Many airlines and shipping companies ask that health certificates for pets traveling through cargo contain a “statement of acclimation” that gives a temperature range in which we feel your pet can travel safely. A majority of these companies ask that the temperature range on this statement covers from 20 degrees Fahrenheit to 80 degrees Fahrenheit. Some animals may not be able to handle the temperatures at the lower and upper end of this range. Please know that any acclimation statements the doctors at Adamstown Veterinary Hospital write will include the temperature ranges in which we feel your pet can travel safely. There may be times during which the ambient temperatures fall outside of the temperature ranges we write on our acclimation statements. During these times (especially during the winter and summer months), you may need to be a little more flexible with the timing of flights. If you are planning on traveling with or shipping a pet or you are a breeder that needs to ship a puppy, please keep the temperature ranges in mind when making any travel or shipping plans. You are always welcome to call us if you have any questions regarding travel health certificates.